Sat, May 12, 2018, 08:58 pm SL Time, ColomboPage News Desk, Sri Lanka. 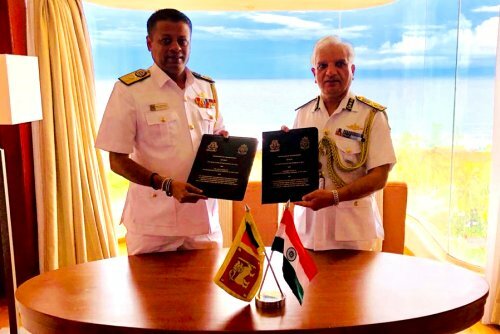 May 12, Colombo: The Coast Guards of India and Sri Lanka today reached an agreement to establish a collaborative relationship to combat transnational illegal activities at sea and develop regional cooperation between the two maritime security agencies. Recognizing that cross border crimes at sea create a threat to the safety of maritime transportation and economic activities and endanger the safety of both countries, the two Coast Guards have decided to collaborate in combating such activities. Director General of Indian Coast Guard Rajendra Singh and Director General of Sri Lanka Coast Guard Rear Admiral Samantha Wimalathunge signed a Memorandum of Understanding (MoU) in Colombo today for the establishment of a collaborative relationship to combat transnational illegal activities at sea and develop regional cooperation between two Coast Guards. 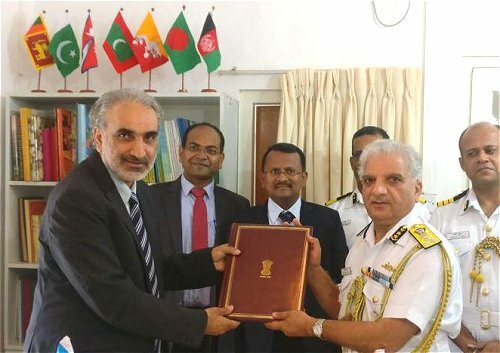 Director General of Indian Coast Guard also signed the MoU for Cooperation on the Response to Oil & Chemical Pollution in the South Asian Seas Region on behalf of Government of India and handed over the Instrument of Consent to the Director General of South Asia Cooperative Program (SACEP) in Colombo today (May 12). The MoU intends to promote closer cooperation between India and other maritime nations comprising the South Asian seas region namely Bangladesh, Maldives, Pakistan and Sri Lanka for protection and preservation of marine environment in the region. The Oil and Chemical Spill Contingency Plan will greatly help in mitigating the impacts of the oil and chemical spill in Indian Ocean.